UPDATE: With CRM2015 - the new client side process API should be used to set the current step. The following approach should be only used for setting the process to the first step. If your users would like to change the Business Process Flow stage dynamically based on a given set of attribute values then it is not immediately obvious how this can be achieved. 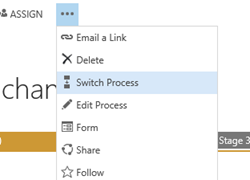 This post provides one solution using a custom workflow activity in combination with the new Synchronous Workflow feature of Dynamics CRM 2013. Initially I thought that these attributes might be able to be updated using a workflow directly, but it turns out you can only update them via code. These parameters need to be strings since you cannot pass in EntityReferences to the Workflow and ProcessStage entities. 3. Deploy your custom workflow activity. Start when: Before – Record fields change. Select the attributes that the process stage is dependant on so that it does not run on every change. 4. Add a set of conditions to determine if the stage should be changed and call your custom workflow activity providing the Process Name and Process Stage to change to. UPDATE: Rob Boyers pointed out that this doesn't reliably refresh the process, however there isn't currently a supported way of doing it. This technique could also be written using a plugin - but the advantage of using a Synchronous workflow is that the logic that determines the stage can be easily changed without re-compiling code.